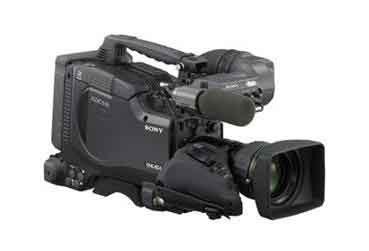 The Sony XDCAM HD system is a highly versatile production tool that offers flexible recording functions including a choice of video frame rates, interlace or progressive modes, recording data rates, and both HD and SD formats. 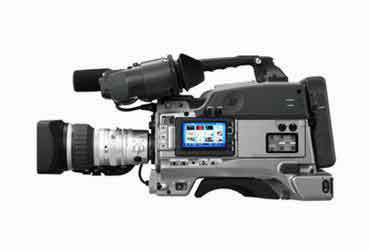 The PDW-F355L XDCAM HD Camcorder features MPEG HD and DVCAM switchable recording with three 1/2-inch HD CCDs. It is capable of recording 1080 video lines of multiple frame rates at a high bit rate of up to 35 Mbps. It also provides four channels of high-quality uncompressed audio. This allows an SD to HD migration path to a complete HD-based environment. Down-conversion output to SD is a standard feature in this camera. Instant random access, replay of clips, IT network capability and the proxy data advantage provide for an exceptional workflow. The PDW-F355L provides excellent picture quality, adapting Power HAD HD CCDs (1440x1080). It offers HD recording in 1080/59.94i, 50i, 29.97P, 25P and native 23.98P and the operator can also select the desired bit rate to record it, either 35 Mbps, 25 Mbps and 18 Mbps depending on the desired picture quality and recording length. Being a dual format camcorder, it can also record in DVCAM mode at 25 Mbps. In addition to these impressive capabilities, PDW-F355L also provides numerous innovative features like Quick & Slow Motion, commonly known as overcranking and undercranking, Slow Shutter, Clear Scan, Interval Recording and Auto Focus Function. It also supports i.LINK interface for File Access Mode and DV stream output (including down-conversion from HD material). 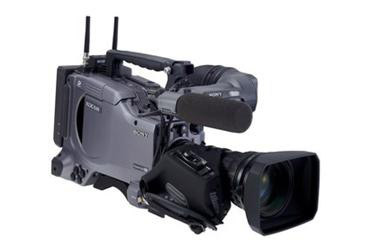 HD 1080 Recording at Selectable Bit Rates The XDCAM HD products record video signals in 1080/59.94i, 50i, 29.97P, 25P, and native 23.98P using the "MPEG HD" codec that adopts the industry standard MPEG-2 MP@HL (1440) compression. Users can select desired bit rates either from 35, 25, or 18 Mb/s depending on their requirements for picture quality and recording length. Choosing the highest bit rate of 35 Mb/s results in the highest-quality pictures over a long recording time of over 60 minutes (single layer disc) 150 (dual layer disc), while choosing the 18 Mb/s bit rate provides a recording time of over 120 minutes (single layer disc) 270 minutes (dual layer disc), which is the longest recording time offered by any current HD camcorder. DVCAM Recording and Down Conversion The XDCAM HD camcorder provides the powerful capability to record in DVCAM format (25 Mbps) with NTSC/PAL and 16:9/4:3 switchable modes. Both camcorders and deck incorporate a down-conversion capability that allows material recorded in the MPEG HD format to be converted to DV signals and output via the i.Link port, enabling users to edit the material using compatible DV-based nonlinear editors. High-quality Audio Recording Record 2 or 4 channels of uncompressed high-quality audio as specified by the recording format selected. 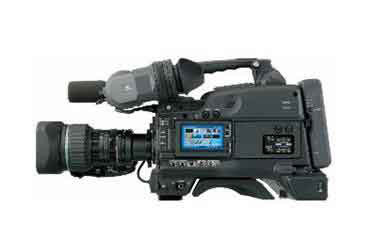 These camcorders are also equipped with a range of audio interfaces: one 5-pin XLR front stereo microphone connector and two rear-mounted, 3-pin XLR connectors with selectable MIC/Line level input. The two 3-pin XLR connectors can also be switched to accept four channels of AES/EBU digital audio input, establishing a full digital ENG/EFP system. The camcorder is also equipped with Rear XLR-5pin output. - MPEG HD recording: 4 channels, 16 bits, 48 kHz, or 2 channels, 16 bits, 48 kHz. - DVCAM recording: 4 channels, 16 bits, 48 kHz. Proxy AV Data Recording During the recording process, a timecode accurate, 2Mbps, MPEG-4 'copy' of the high-resolution material is captured to the Optical Disc media. This proxy video can be used as reference to the high-resolution video for edit decision-making. Depending on the device from which file transfers occur, the Proxy AV data can be sent at up to 16-18x real-time, enabling an optimized workflow for the time-sensitive nature of ENG, while providing significant flexibility for production use. Metadata recording: During the recording process UMID, Extended UMID, and Essence Marks data is captured to the disc. Progressive Mode (30P and 24P) Provide true progressive modes for film. - 29.97P and 23.97P High definition video is recorded at the native frame rate. When recording in DVCAM, 24P frame rate video is recorded as 60i with 2-3 pulldown. Freeze Mix This feature superimposes a previously recorded frame of video over the live picture in the viewfinder. This enables the photographer to adjust the camera's position to get the same framing for the next shot. Slow Shutter A maximum of 64 frames can be accumulated using the slow shutter function. In low light levels this allows clear video to be shot, and provides a fantasy video effect with ghost image. - 1-8, 16, 32 and 64 frame accumulation - Turbo Gain allows the camera gain to be boosted up to +48 dB. Interval Recording Records video at pre-determined intervals. Ideal for recording over long periods (time-lapse recording) up to 24 hrs. Picture Cache Recording Up to 10 seconds audio and video signals are buffered into camcorder's memory before the Rec button is even pressed. Optical ND filter The built in Optical ND filter has 4 settings. (Clear, 1/4ND, 1/16ND, 1/64) The camcorder can memorize independent color temperature settings for each filter wheel setting. 3.5-inch widescreen color LCD An easy-to-view color LCD screen provided on the camcorder side panel enables advanced operations such as Thumbnail Search and Scene Selection. Status indicators such as four-channel audio meters, and disc and battery remaining time can also be displayed. Camera set-up menus can be displayed, too. Viewable area measured diagonally. 12-bit A/D Conversion Incorporates a highly integrated 12-bit A/D converter, so that the high-quality images captured by the CCDs are processed with great precision. In particular, this higher bit resolution allows contrast to be reproduced more precisely in mid-tone areas of the picture. Advanced Digital Signal Processing A key to quality in DSP cameras is how many bits are used in their nonlinear processes, such as gamma correction. XDCAM HD camcorders use more than 30 bits, minimizing round-off errors so the high quality of the CCDs is maintained. The DSP LSI of XDCAM HD camcorders also enable highly sophisticated image control such as Multi-Matrix function, and Skin-Tone Detail control. Noise Reducing Mode The XDCAM HD camcorders incorporate a noise-reducing mode to reproduce low-light scenes clearly. Selectable Modes of File Recording Two types of file recording mode is provided. In standard operation, one clip file is created each time recording is started and stopped. In the other mode, called Clip Continuous REC Mode, one clip file can be created while multiple record start and stop. Rugged and Ergonomic Design The design of these camcorders is based on years of Sony experience in camera ergonomics, and provides a high level of mobility and balance. The shoulder pad position is adjustable and the viewfinder height can be selected from two positions, while rear panel connectors are located well away from the battery pack, making it easy to connect cables. Operators familiar with the comfort benefits of Sony Betacam camcorders will immediately feel at home with XDCAM HD camcorders, which extend this comfort even further. Shock- and Dust-Resistant Disc Drive To minimize errors caused by shock or dust entering the disc drive, XDCAM HD equipment has several unique ways of providing operational resistance to such factors. This disc drive entrance is concealed by two lids helping to prevent any dust from entering the drive. In addition, four rubber dampers are used to hold the disc drive block in place helping to absorb the shock that would otherwise go into the disc drive. Memory Stick and Memory Stick Pro(up to 2GB) Support The Memory Stick function supports the storage of camcorder setup files for reuse, or quick, replication of camera setups during multi-camera shoots. Auto Tracking White Balance Automatically adjusts the camera color temperature according to lighting changes. Four Assignable Buttons (Two on camera handle, two on the side panel) These assignable buttons enable the operators to assign frequently used functions. Genlock In BNC x1, 1.0 Vp-p, 75 ? TC IN BNC x1, 0.5 to 18 Vp-p, 10 k? Composite Video Out BNC x 1, 1.0 Vp-p, 75 ? TC Out BNC x 1, 1.0 Vp-p, 75 ?